The North American Electric Reliability Corporation's (NERC) recent 2017 Summer Reliability Assessment finds that there are enough resources to meet this summer's projected peak electricity demand in all areas of the country. Anticipated reserve margins, the amount of expected unused electric generating capacity at the time of peak load, range from slightly less than 15% in New England to almost 29% in New York. In the absence of cost-effective, large-scale electricity storage, reliability of the nation’s electric power system requires that electricity be available to meet demand at any moment. NERC, a nonprofit corporation that oversees regional electric reliability entities in the lower 48 United States, Canada, and parts of Mexico, publishes summer reliability reports that assess existing and planned generating resources, anticipated electricity demand, and other factors in each region. An important metric of electric reliability is the anticipated reserve margin, measured as the percentage by which expected generating capacity exceeds net internal demand. Net internal demand reflects the total internal demand minus demand-response systems that are expected to be available during a peak demand hour. A reserve margin of 15% means that about 15% of a region’s electric generating capacity would be available as a buffer to meet the summer’s peak hourly load in case of unforeseen generation or transmission outages. Reference margins, which differ by region, are reserve margin targets based on each area's load, generation capacity, and transmission characteristics. In some cases, the reference margin level is a requirement implemented by states, provinces, independent system operators, or other regulatory bodies. Reliability entities in each region aim to have their anticipated reserve margins surpass their reference margins, which are generally set near 15% in most regions. Note: ISO is an independent system operator. The anticipated reserve margins for all U.S. regions in NERC’s assessment are higher than their reference margins this summer, except for the Independent System Operator for New England (ISO-NE). In ISO-NE, the anticipated reserve margin is 14.9%, slightly lower than the reference margin of 15.1%. ISO-NE has 29,984 megawatts (MW) of anticipated resources this summer, which includes certain existing capacity and net firm capacity transfers from other areas. Another 315 MW of prospective resources are expected to become available this summer but are not included in the calculation of anticipated resources. Including these resources brings ISO-NE’s prospective reserve margin to 16.1%. Anticipated reserve margins are highest in the New York Independent System Operator (NYISO) and PJM Interconnection, where reserve margins exceed 28%. Reserve margins that are significantly higher than target levels, although helpful for reliability, indicate the region may have excess underused or unused generation capacity. Demand response resources play an important role in electric reliability. Demand response involves the targeted reduction of electricity use during times of high demand. For instance, contracts between utilities and customers may allow power system operators to temporarily turn off some air-conditioning equipment or industrial processes during demand-response events. In return, customers receive incentives for these reductions. 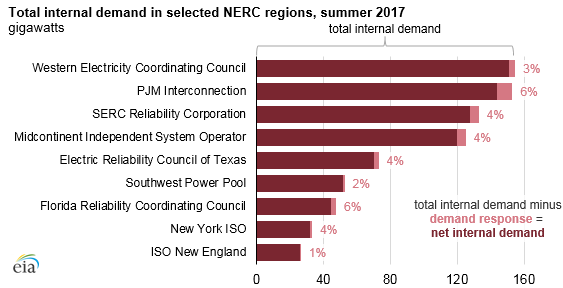 Based on data compiled by NERC, demand response resources range from 6% of total internal demand in areas such as the PJM Interconnection and Florida Reliability Coordinating Council to 1% in ISO New England. More information about regional summer reliability issues is available in NERC’s 2017 Summer Reliability Assessment.